On February 16, Alaskans will celebrate Elizabeth Peratrovich Day, an annual event honoring the achievements of one of the most significant and influential Alaskans of the 20th century. Peratrovich, a Tlingit activist, worked relentlessly throughout her life to counter the legally entrenched anti-Native racism that plagued Alaska for decades following America’s purchase of the territory. And in 1945 she offered public testimony before the territorial senate that is considered to have been the key argument leading to passage of the Anti-Discrimination Act, the first formal piece of civil rights legislation ever passed in the United States. 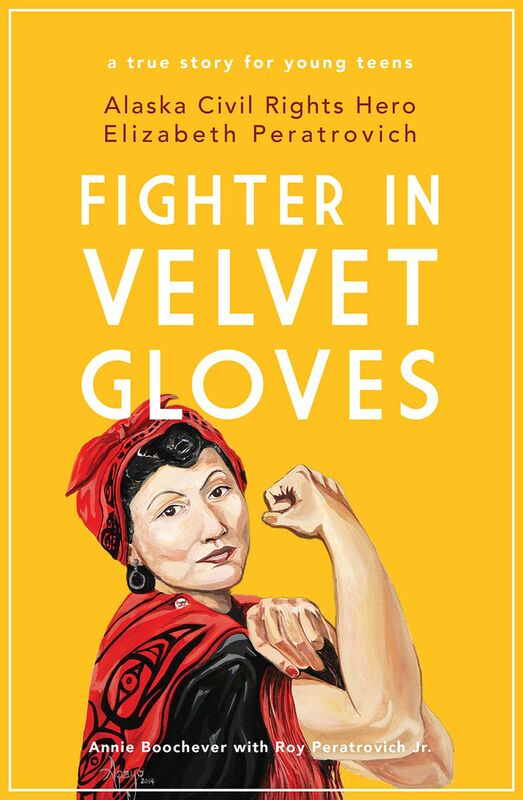 ’Fighter in Velvet Gloves: Alaska Civil Rights Hero Elizabeth Peratrovich, ’ by Annie Boochever with Roy Peratrovich, Jr.
As we learn from “Fighter in Velvet Gloves,” a new biography of Peratrovich written for young adults, Alaska’s civil rights icon could not have come from humbler beginnings. Peratrovich was born out of wedlock in 1911 in the Southeast Alaskan community of Petersburg, something she would not learn until adulthood. Her father was Irish, her mother Tlingit. She was adopted as a baby by Andrew and Jean Wanamaker, a Tlingit couple who took her first to Sitka, and later to Klawock, where she met her future husband, Roy Peratrovich, also of mixed heritage. The book, authored by retired teacher and former Alaskan Annie Boochever, with the assistance of the Peratrovichs’ son Roy Peratrovich, Jr., moves briskly through the teenaged and young adult years of the two Peratrovichs. In 1924, they, along with all Native Americans and Alaska Natives, were granted full U.S. citizenship by a long overdue act of Congress, but in practice, they were denied the rights that accompany this status long after it was given. One of things this book does well is describe the semi-Apartheid conditions that were inflicted on Alaska Natives during the first half of the 20th century. While those familiar with Alaska’s history are painfully aware of what transpired, many Alaskans, especially younger ones, simply do not know. It’s a knowledge gap that makes this book an important contribution, especially in an era when racism is resurgent both in Alaska and America. In prewar Alaska, businesses routinely barred Alaska Natives from entry and “No Natives Allowed” signs were a common sight. It was a situation similar to what African Americans faced in the South. In another parallel to Southern racism, Alaska Natives were required to pass literacy tests before voting, tests that were deliberately engineered for them to fail in order to prevent them from acquiring political influence. Roy and Elizabeth Peratrovich were both active from early in their adulthood in efforts at rectifying the situation. They joined the Southeast-based Alaska Native Brotherhood and Alaska Native Sisterhood respectively, and each rose to the office of Grand President. But for Elizabeth, the incident that led to her full empowerment sprang from one of the most universal sources of all, the concerns of a mother. The couple had three children, and in 1941 moved to Juneau. They ran into housing discrimination immediately, but were able to rent a small home that was walking distance from the city’s school. Then they learned that Native students were not allowed and had to attend a subpar school, located far from their home in the Native district. Unwilling to countenance this, Elizabeth Peratrovich went to the superintendent. No record of what was said exists, but she succeeded in enrolling her children into the nearby elementary school. From there, Peratrovich’s activism escalated. She befriended the territorial governor, Ernest Gruening, who, owing in part to his Jewish heritage, was sympathetic to the disparities Alaska Natives faced and threw the weight of his office behind civil rights legislation. With additional help from a pilot who flew her around Southeast Alaska, and others who accompanied her elsewhere, Peratrovich made her case to Alaskans both Native and otherwise throughout the territory. The first attempt at a civil rights act passed the territorial house in 1943, but died in the senate, where opposition among the entirely white male legislative body was intense. Two years later the act again passed the house as expected. It was in the senate that the fight lay, and in the book’s pivotal chapters, the scene that unfolded is recreated. As testimony ended, the Peratrovichs, who throughout their marriage worked closely as a team, put their plan in motion. Knowing that Elizabeth was the better orator, they did not schedule her to speak during the formal hearing. Rather, they waited until it concluded, and, as per tradition, the senate president asked if any others wished to heard before the bill was voted on. Usually in the legislature this request was met by silence. But on this occasion, Elizabeth Peratrovich rose, walked to the front of the room, and offered the words that immortalized her in Alaska history. “I would not have expected that I, who am barely out of savagery,” she began, “would have to remind gentlemen with five thousand years of recorded civilization behind them of our Bill of Rights.” She shared the experiences of her family and friends and swayed enough senators to bring passage of the Anti-Discrimination Act, which Gruening signed on February 16, 1945, the day that is now set aside to honor Elizabeth Peratrovich. This is a book that should be placed in the required curriculum of all Alaska schoolchildren. More importantly, it’s one that should be read by adults. Anyone who peruses online comments on Alaska news sites or who follows state news stories knows that racism is still being directed towards Alaska Natives. The problem persists and Elizabeth Peratrovich’s work remains incomplete. It’s up to us to continue the job. “Fighter in Velvet Gloves” explains why.